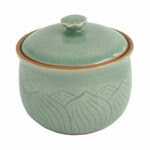 The celadon ceramists of Thailand craft an elegant lidded box by hand. 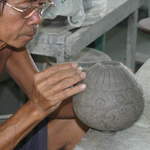 They engrave by hand the lower part of the body with lotus motifs, and shape the lid knob like a flower bud. To craft this box, the artisans firstly cast a clay mix inside a mould. Once solid enough, the piece is removed from the mould and engraved, carved and detailed by hand. When fully dried, it is then fired in the kiln at a temperature of about 800 degrees Celsius. Next, the piece is dipped in a glaze mix and left to dry. Once fully dried, it is fired again in the kiln at a temperature of about 1,300 degrees Celsius. The surface of this celadon box is glossy, green and highly crackled. This box may vary slightly in colors, motifs, shape and weight. The exterior may also show some tiny flaws in the glaze. 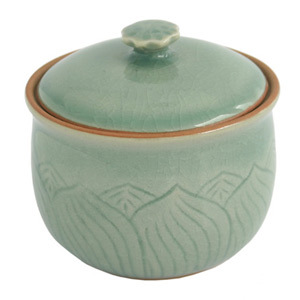 This celadon box is handmade in a small workshop in northern Thailand.